There is a large parking lot in front of the restaurant that serves other businesses in Lamp & Lantern Village as well. We are proud to offer many celebration packages to enhance your special evening, including roses and balloons. Located close to Chesterfield Mall just 2 miles from I-64, The Melting Pot is an elegant, yet approachable addition to Chesterfield’s food scene. In our relaxed, welcoming setting, families feel at home and long-lost friends have the opportunity they need to reconnect. 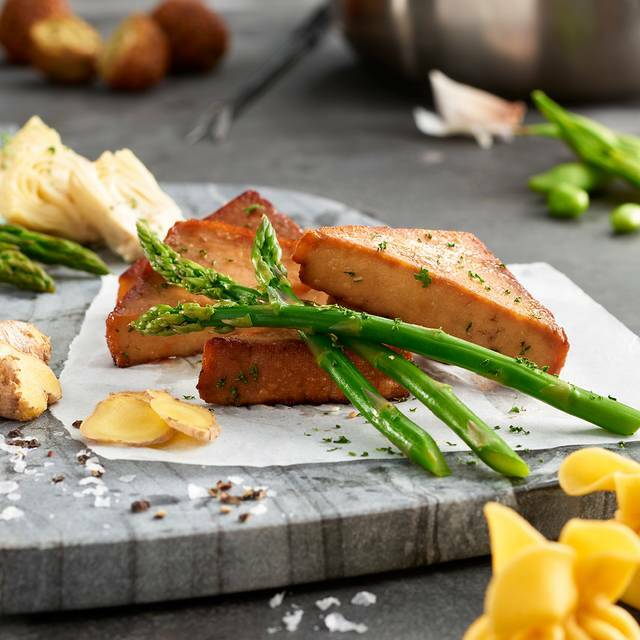 Our crave-able menu selections will leave you begging for more, whether you choose 1, 2, 3, or 4 courses. Dip artisan breads into bubbling cheese. Enjoy handmade salad dressings on crisp greens. Cook tender strips of steak or pieces of shrimp with your cooking style and sauces. 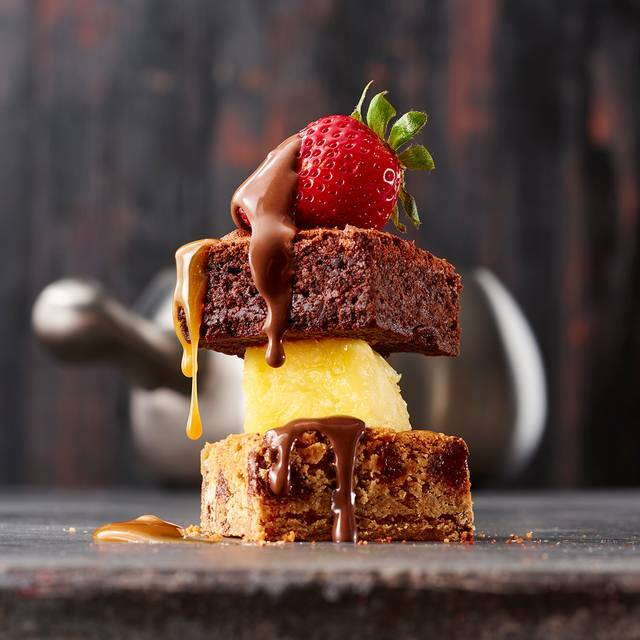 End your culinary journey with one of our famous fondue desserts, which include fresh fruits and melted, gooey chocolates. We have a large wine room to display our award wining wines (recipient of the Wine Spectator Restaurant Award for over 12 years). Enhance your special dining experience with one of our celebration packages, including roses, balloons and more. 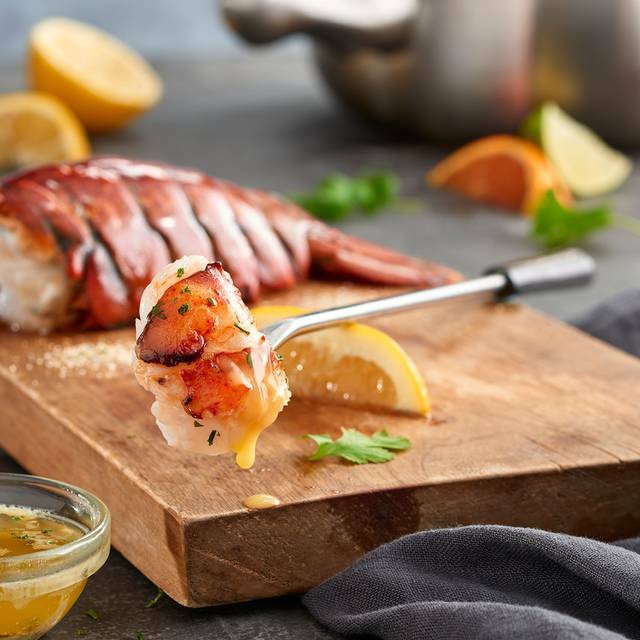 For occasions that matter, we’re proud to be your go-to spot. If you're going to go, get the cheese and chocolate. Skip the actual entrees. They aren't good enough to be worth the money. Only minus is they sat us at a table next to a crying baby. Somewhat ruined what was supposed to be a double holiday celebration meal. Well we never got any refills for drinks. We felt like the waitress was rushing us to move through courses. So it wasn’t that enjoyable. It used to be a lot better. overall, it was good, but they forgot about the add on that I added when booking via the app. We made a reservation expecting a nice quiet and romantic night out. We were placed at a table near the bar and the kitchen. The kitchen/people in the kitchen were extremely loud and interfered with our table conversation. It was disappointing considering what we were expecting. However, the food was very good. Hostess’ were not welcoming at all. Neither one made eye contact besides when asking how she could help. We didn’t even get a smile or eye contact when we left. We felt rushed, two people flew over to our table and looked shocked (for an awkward 10 seconds) that we were still sitting and chatting. The place was empty so it wasn’t like they needed to clean up right away, they stared at us awkwardly and took some of our dishes away. Food was delicious as usual, but we will not be going back to this location. Hostess are the first and last part of the “experience” and it was a total mood killer. Waited a really long time between salad and entree. We watched the broth boil down for 30 mins before we finally asked for our waiter. The manager finally came over to serve the entree. We had to take the dessert to go. I was disappointed, for the price this was a “would never do again.” In the waiters defense he was informative and pleasant, just non existent. I love this place!!!!!! The food is amazing and the service is always great. Nice for a date because it’s cozy with dim lighting. Very nice atmosphere. Always the family’s favorite place for a celebration! High quality food, fun experience. Slow and steady meal - loved it! Very expensive for what you actually get to eat. The meat was boiled in a broth and then we dipped it in a sauce . Would rather have the meat grilled . Great food and service. The family night was fun and our kids really enjoyed it. Great place to go with friends or on a date. The food is great and so much fun to dip. 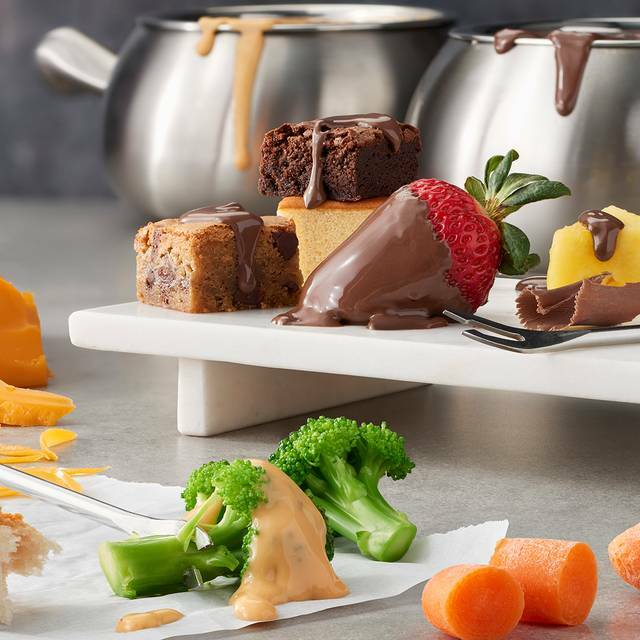 The Melting Pot is a very unusual and entertaining experience. 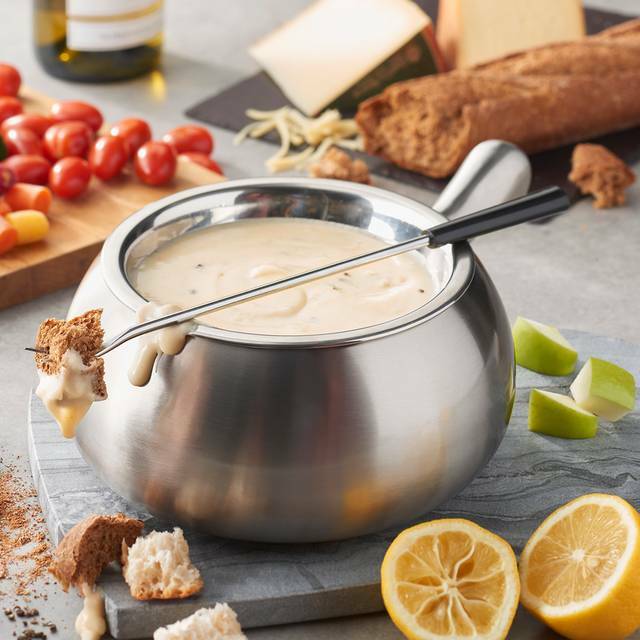 You start by picking a cheese fondue, that is prepared at the table right in front of you. They had multiple selections that all sounded outstanding and our spinach artichoke was delicious. Then, you get a salad choice (again, several good options). We both chose the pick-4-options entree, and here's where it went from a perfect score down to a very good one. The steak was not the best. We each had a piece that had too much connective tissue to eat the entire bite, and they are already small bites, so they should have trimmed around that piece instead of serving it to us. Dessert was also a fondue, and we chose the custom blend and it was OUTSTANDING. It is expensive for the portion sizes that you get, but the selections are very good and there is plenty of variety. We did choose to add extra berries, and it was rather expensive for the very few berries they added to the selection. Overall very good and we would recommend it to others. It just wasn't a 5 star experience for a few easy to fix reasons. A lovely anniversary dinner. Excellent! Will be going back soon!!! Had an amazing waiter! We finally ate dinner there for our 48th anniversary. Jeff our waiter was excellent in all aspects of the meal. He explained all tbe options we had with every course. The food was excellent and interesting. We enjoyed ourselves tremendously, and we will be back. Amazing. They never disappoint; I would be there every weekend if I could but I don't have that kind of money!! HA! Even though I gained 3 pounds, 10/10 enjoyed. An amazing experience, with outstanding service. Can’t wait to go back. Fun birthday dinner for our daughter! A fantastic meal. A great dining experience. The food is fantastic the service is excellent. 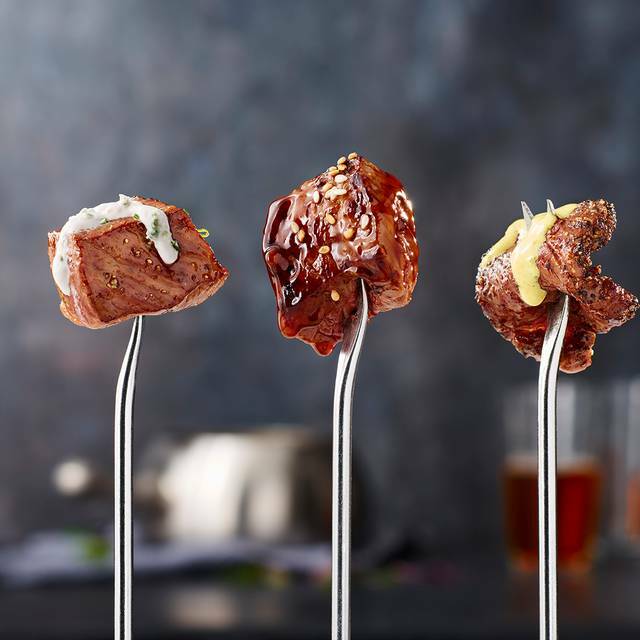 There are menu options for every taste. Parking is free and ample. We all had a great time! The food was great, the service was good. The table was not ready at our reservation time, so we got out a little later than I thought. Been here about a half dozen times in less than a year and have never had to wait 30 minutes for a server to show up to the table, after asking who our server was 20 minutes into waiting . Worst service tonight. May not go back for a long time which is sad because I’ve been a long time fondue goer with every state I’ve lived in. What a wonderful experience. What a enjoyable way to be able to socialize and prepare your own food. The evening was just perfect. Everything was delicious , from the cheese fondue, the main course,to the chocolate fondue.Of course the dessert was probably my favorite. 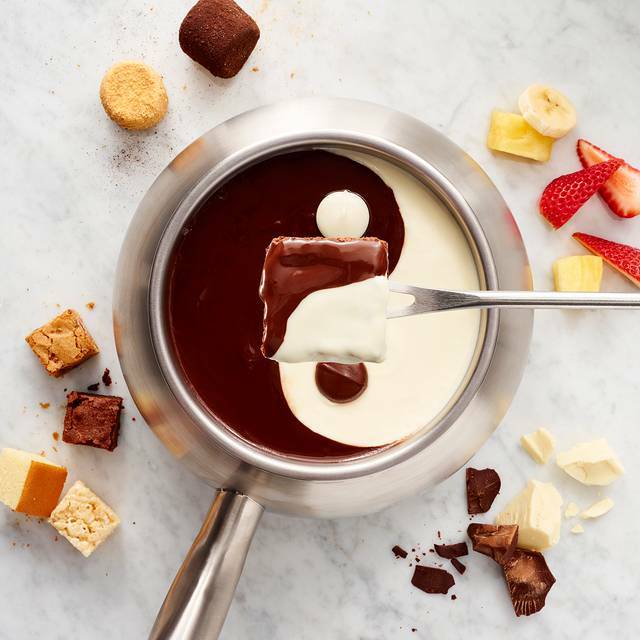 I would recommend The Melting Pot to anyone who wants to have a enjoyable evening out with friends or a romantic dinner for two. Our waiter was amazing!! He clearly had some allergies and wasn’t feeling very good but he was still super funny and accommodating to all of our requests. He had it a wonderful experience! Excellent customer service, beautiful atmosphere and great memories. Our waiter was excellent! It was an experience I won't forget. 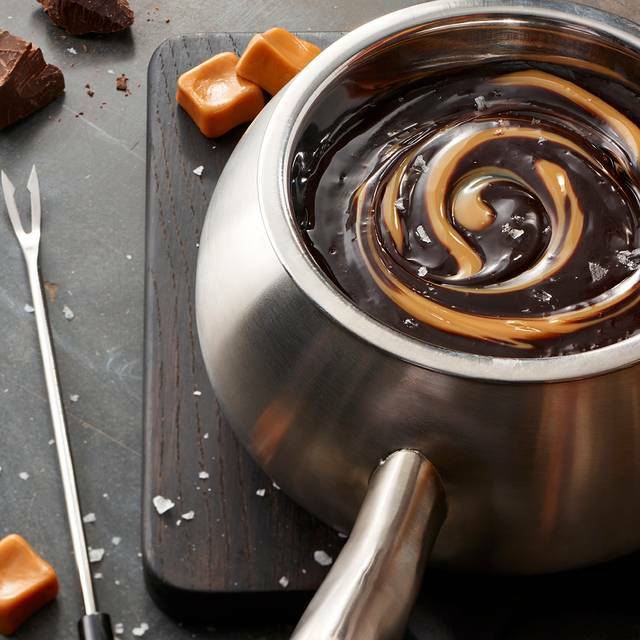 Love going to the Melting Pot - always a great evening! We love the melting pot. It's a little pricey so we don't get to go as often as we'd like but you definitely get your money's worth. Service and food was tremendous. We were seated right away. Our waiter was tremendous. We were very pampered. I felt as if the waiter read our table very well and became a nice part of the the evening. Everything was great!! The atmosphere was fun. We had the most wonderful server, Adam! He was very attentive and informative as this was our first time doing a four course meal here!!! He made our anniversary dinner very special! I would love for him to be our server again!!!! Will definitely be coming back!!!! Thank you so much!!!! The food was wonderful as well. 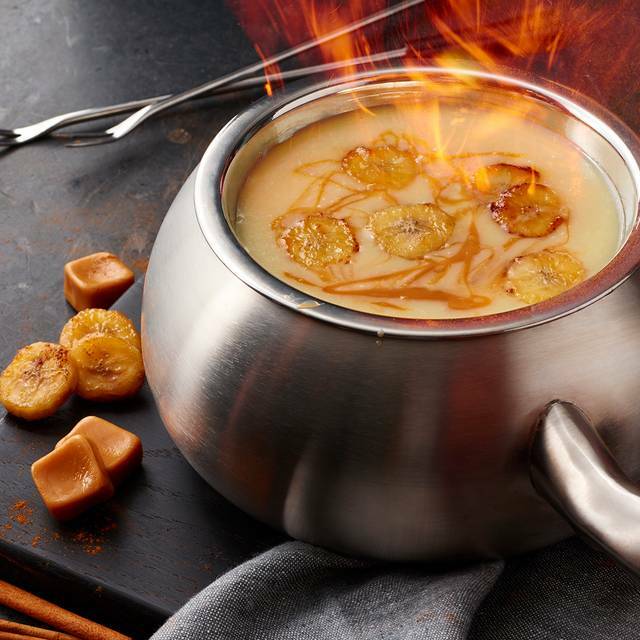 The Melting Pot is a great fun night out with family or friends. The servers are spectacular and readily explain everything that you need to know. There is a good variety of selections. The only thing to keep in mind is that it is somewhat expensive and probably something that you would not do frequently. The basic course includes salad, cheese fondue, meat/seafood fondue and then chocolate fondue. It is essentially a bundled meal. In the end there is too much food so you may want to delete some of the items, like the salad and concentrate on what you really enjoy. Again it is a fun place to go. I really enjoy the Melting Pot. This last visit the music was a little loud. My guest and I could hardly hear one another unless we were speaking loudly and one of the nice things I have always liked is the quiet ambiance. The food was delicious. The server make excellent suggestions. Will definitely return. homemade pepper ranch dressing. For our main entree we chose the chicken, steak and pork it was delicious. To finish it off we had the flaming turtle dessert and we couldn't imagine a better choice :-) thanks for a great evening and we will definitely be back. The food was EXCELLENT, the service spot in.....and our server was so nice and friendly. It was my son's birthday, and he was given chocolate strawberries to take home. How sweet! We've eaten here on several occasions, and you never fail to delight us. Excellent service. Knowledgeable, courteous staff. I do wish the service was a bit faster. It took longer than it should’ve.